Very nice, AJ! Congratulations. It's gratifying to see all that hard work pay off like this. Congratulations, AJ (and to Sally). I will see you in the field soon. AJ, Do you have a pic of the inside connection between the back and kidney (specifically to see the snap plate locations)? You probably do somewhere in your build thread... Perhaps if you use snap plates that have minimal flex (nylon or less stretchy elastic - perhaps elastic turned sideways, which doesn't stretch the same as length-wise) on each corner where it sticks way out, that will pull the back into alignment with the kidney, while keeping it from sagging over the top of the kidney. Then you could experiment with loosening the shoulder connection. More from Carida-land... re: back plate flare The back plate sits very flat against your upper back, but the connection as it stands may be pulling the top too close to your back, and forcing the bottom to sit further out than it should. If you relax the shoulder connection to the chest plate, would that let the upper portion sit out a little, but not too much, and allow the lower portion of the back plate to slide closer to your back, thereby bringing those wings more in line with the kidney? I found personally that when I stand with my shoulders back, the natural curve of my upper back makes the back plate sit a little more In line with my kidney. I look forward to the daily edition of TK life with Lorelei. This build has high entertainment value! I'd say you have room to trim both the eyes (to the trim lines you drew) and the teeth a bit more. I got to see Lorelei's neck seal creation live and up close this weekend...it was pretty cool, and an ingenious approach. The rubber might get a little sweaty, but some fabric on the inside will fix that nicely. I think Lorelei got past some of the initial butterflies giving her biceps a workout, and she should be off to the races now! Watching with keen interest. Another garrison-mate watching with anticipation. Love this thread so far! You may be way beyond snap plates at this point, but jic it makes a difference, I used nylon, Tandy 24, and my kit is RS. 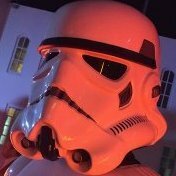 No issues 2 years into my trooping career. Keep on rocking, Lorelei! Voted. Nicely done by all the entrants! Got it! I'm on it. I'll see you back here soon. Thanks, Brian. Darman's neck seals work really nice. They came highly recommended to me, so I'll pay it forward here. I have not had any issues with comfort. If you have any concerns with your current piece, you can't go wrong with this one. Thanks, Tony! Thrilled to be here and join the EIB ranks. My end goal is one step higher, so you'll see me here again soon. I do have a 10 year old Jawa waiting in the wings, so time is in high demand. 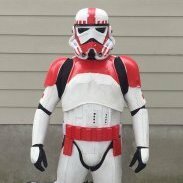 In the spirit of troopers helping troopers, which is what got me here, I have to shout out to my Garrison Carida Academy advisor, Jamie (Darth Havoc) and several others on the boards for their patient insights, as well as countless hours here on FISD digging thru the archives, including your gold standard build thread, Tony. Thanks also to Preston (Pretzel) for helping me get over some of my technical literacy hurdles.